Quercus Silver: My cufflinks got married! Sometimes you get a reminder about what a priviledge it is making jewellery and how important it is to do your best. I got a mail the other day from Carrie, a lovely person who'd bought a pair of my orange resin cufflinks. 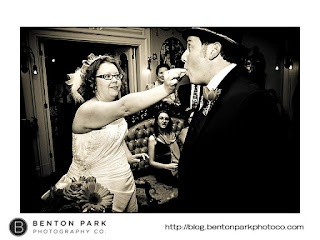 I was really pleased to hear her husband-to-be was going to wear them to their wedding but I was absolutely delighted that she was kind enough to share some pictures from their happy day in St Louis. 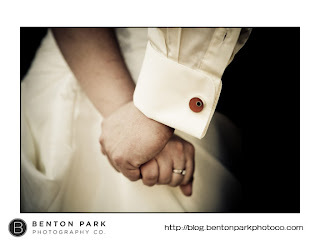 The bride was radiant, the groom proud and handsome and my cufflinks looked pretty fine, too. Proud fit to burst, I am. Congratulations Carrie and Bret. aw, that's lovely that she sent you follow up pics! what a cool photo, you should ask her if she'd mind if you used them in your listings.